When it comes time for my Tuesday lunches with Kelly, I’m trying to adjust my perspective. There is a part of me that wants every bite in Toronto to prove a theory (more like a wish) that it’s a city packed with veiled grottos full of pulchritudinous people eating coquettish comestibles. This is unrealistic and silly. You know this. I know this. I’m one person, and even with guides, there are natural limits to what I’ll be exposed to. No matter how much I learn, I’ll still be a prisoner of my ignorance. Not to mention urban areas mean more options; both good and bad. It’s a bell curve and most restaurants lie somewhere in the middle. But I’m in this for the long haul. At this point in my journey if someone asked me as an outsider, what appeared to be the most iconic Toronto dish, I’d say, “butter chicken roti.” This dish may be available in other cities, but it’s held in such high esteem here. It’s available in so many places in so many ways, it feels almost as universal (locally) as a hot dog. But this is my first time. I grew up in a family that went out for Indian food quite a bit, but I wasn’t aware of murgh makhani (butter chicken) until the last decade. Chicken Tikka Masala, yes, but not this Indian specialty that originated from Delhi in the ‘50s. Add to that; I’ve had roti (primarily Indian and Malaysian) — but not done up in style of a Carribean pocket sandwich. Gandhi Roti itself is unpretentious and straightforward, friendly and comfortable. Small. Open kitchen. Cozy with a floor show. They have a simple goal, to feed you well, and promptly. They deliver. I’ve no authority to declare this, “THE BEST EVER!” though folks in Toronto have. This is an intensely satisfying meal: hot, chewy, hearty, spicy, creamy. I think I want another one. I may be able to get this dish elsewhere, and while I should compare, I do want another one and I would rather just get the one from Gandhi Roti. 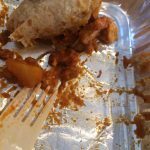 Founder of blogTO and publisher of “Toronto Food Trucks,” Tim Shore, takes a brief look at Gandhi Roti on blogTO. Here’s the “History of Butter Chicken, Indian Cuisine’s Most Loved Curry” from New Delhi Television and author Harnoor Channi-Tiwary. Lisa Jackson and Food Network Canada give a good overview of the dish’s local history: “The Tasty History of Roti in Canada”. Lastly, “Indian Butter Chicken, by Way of Australia,” yes, it’s an Australian recipe, written up in The “Failing” New York Times. Very un-Canadian, but also a nice description of the dish. Worth reading and/or making at home.